A Bible card published in 1907 by the Providence Lithograph Company. Public domain. And then there are uniforms: clothing that sends an impersonal, public message. Doctors wear white coats. Police wear blue uniforms. In this Torah portion, Parashat Tetzaveh, we get the directions for the uniform of the High Priest of Israel. 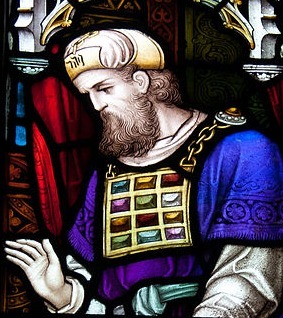 God instructs Moses to produce an entire wardrobe: a breastplate, an ephod, a robe, a gold frontlet inscribed “holy to the Lord,” a fringed tunic, a headdress, a sash, and linen pants. Inside the breastplate are supposed to be something called ummim and thummim, which the priest will use to find answers to questions. The outfit was colorful and some things about it are mysterious to us today (ephod, ummim and thummim, for instance.) The text doesn’t explain those words because it assumes we know what they are. A careful reader will notice that the uniform mixes linen and wool threads, something we are forbidden to do in ordinary garments. This is a way of expressing the extraordinary nature of these clothes: they are what the high priest will wear in the presence of the Holy One. I imagine Aaron was very nervous when he heard about this uniform. He may also have felt somewhat confused when he heard what he was going to do in that fancy outfit. The kohanim [priests] had many tasks, but the most common task was to sheckt [slaughter] the animals for the sacrifices, then cut them into pieces and stack the pieces on the altar. They tended the sacrificial fires and then carried out the ashes when the fire was finished. In other words, Aaron was going to do some of the bloodiest, filthiest work imaginable in that fancy outfit! The other Aaron, the private Aaron, is the human being who wept in his tent later. He made mistakes (big mistakes – see the Golden Calf in Exodus 32 and the episode with his sister Miriam in Numbers 12.) Being Kohen Gadol was a heavy job because he was suspended between the public role and the private self. Someone had to be in charge of the sacrifices. Someone had to be the visible link to the God of Israel. Aaron was given that task, and we do not know how he felt about it. Do you wear a uniform in your work? Do you have a public, professional persona that sometimes has to suspend personal feelings for the public good? What do you do to “let down your hair” and relax? How do you care for the the private self that has to wear the professional role? Posted on February 21, 2018 February 21, 2018 Categories D'var Torah, Synagogue LifeTags clothing, TetzavehLeave a comment on Tetzaveh: Dressed for Success? For those of us who enjoy parsing bible, this very first verse of the sidra gives us a rich seam of learning. God is instructing Moses on what will happen inside the Mishkan, the portable tabernacle used for worship in the wilderness years. The sidra gives us elaborately detailed instructions for the clothing of the priests, and about the ceremony of ordination in which they will be dedicated to the service of God. The purpose of the clothes and the rituals are made clear – it is to make the priests holy. Parashat Tetzaveh begins with the pure olive oil for the Temple lamps, and continues with a detailed description of the priestly vestments and the ordination of Aaron and his sons as the first priests of Israel. This is a Torah portion that lends itself to flights of fancy. The ancient rabbis and modern Hebrew school kids both love to visualize the vestments and imagine the exact appearance of the great candelabrum. The ordination is a bit grubbier, with its orders for dabs of blood here and there, and splashing of blood and stacking of gory sacrifices. It is tempting to separate the two, to focus on the beautiful priestly garments, made from wool and flax, woven with many brilliant colors and studded with jewels. It is no accident that the two descriptions come together in the Torah: first the beautiful clothing and ornaments, then a description of what was to be done in those vestments. The Kohen Gadol, the High Priest, did not sit on a throne observing the action in the Temple. The work of a Cohen was the work of a holy butcher, calming the beasts, blessing them, then slipping a very sharp knife through skin and veins and cartilage. When the animal collapsed, then the priests had to work together to skin it, to cut it into the pieces the sacrifice demanded, and to stack it up on the altar to be burned. This is not delicate work, and it is certainly not clean work. By the end of a busy day at the Temple, the Cohanim must have looked ghastly. Even their ordination required them to be anointed with the blood of a sacrificial animal, underlining the work that they were to do. In the 21st century, we often talk about “spirituality” as if it is something very beautiful and serene. And I imagine that the priestly garments, when new, were magnificent. But in the actual business of doing the holy work, something happened: everything got messy. Blood and tears and mess were smeared about, splashed about, and the beautiful garments got dirty with blood and soot and gore. And folks, that is real life: the “perfect” Shabbat table gets messy with spilt wine. The most elegant Chanukah menorah will be covered with wax at the end of the holiday. Real, adorable babies wear diapers. And our real lives are not as we dream them: they are messy with frailties, bad habits, neuroses, and failings. Our task is to learn to see the toddler under the spaghetti sauce, the human being in a sneering teenager, and the spark of the Divine in our own fallible selves and others. It is then that we have truly internalized the lesson of the Kohen Gadol in his magnificent, bloodied vestments: within the mess, there is holiness. Image: Andreas F. Borchert, licensed under the Creative Commons Attribution-Share Alike 3.0 Germany license.